In April 1985 Wham! became the first western pop group to perform in China. The band’s management hired Lindsay Anderson to direct a documentary recording this historic event. Unfortunately this was an ill-fated project with Anderson being removed from the film in October 1985. His portrayal of the Chinese tour did not meet with the approval of the band or their management. A new director was brought in and a shorter film, very different from Anderson’s documentary, was produced. This article draws on Anderson’s correspondence and diaries to provide the story behind the directors ‘lost’ film. Lindsay Anderson accepted the invitation to record Wham!’s visit to China at a time when he was finding it increasingly difficult to get his own films made. In 1982 he released the film Britannia Hospital, a biting satire set in a hospital preparing for a royal visit to celebrate its 500th anniversary. It was a critical and commercial flop, its prospects not helped by the film appearing to be ‘unpatriotic’ at a time when Britain was fighting the Falklands War. Britannia Hospital had failed to repeat the success of Anderson’s earlier films. In the years following its release he turned to the stage, where he always found it easier to work, and directed a number of productions in London and the US. At the start of 1985 he had just returned from Washington DC where he had directed a troubled production of Hamlet which was plagued with problems and closed after a short run. Anderson rarely worked as a ‘director for hire’, preferring to have total control over the films he made. However he was tempted by the offer of returning to his documentary roots. Anderson had begun his filmmaking career in the 1950s making documentaries. Indeed he won an Oscar for a short documentary, Thursday’s Children (a film about a school for deaf children) in 1954. In a letter to a friend written in January 1986 he explained that he undertook the Wham! project “in a spirit of curiosity. Curiosity about China and curiosity about the odd confrontation of China and Wham! – and even a certain curiosity, not very great, about the phenomenon of Wham! itself.” (Ref. LA 1/10/3/8). 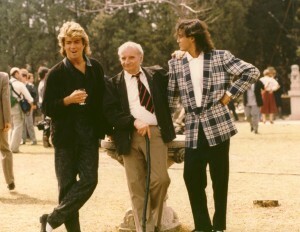 Lindsay Anderson and Wham! in China. Anderson travelled to China with Wham! in April 1985. The tour began with two concerts in Hong Kong and then moved to China where Wham! performed in Beijing and Canton. During the tour Anderson suffered a fall and spent much of his time in a wheelchair. His diaries also reveal that he was suffering from arthritis in his legs and hands (something he hoped Chinese medicine might cure). 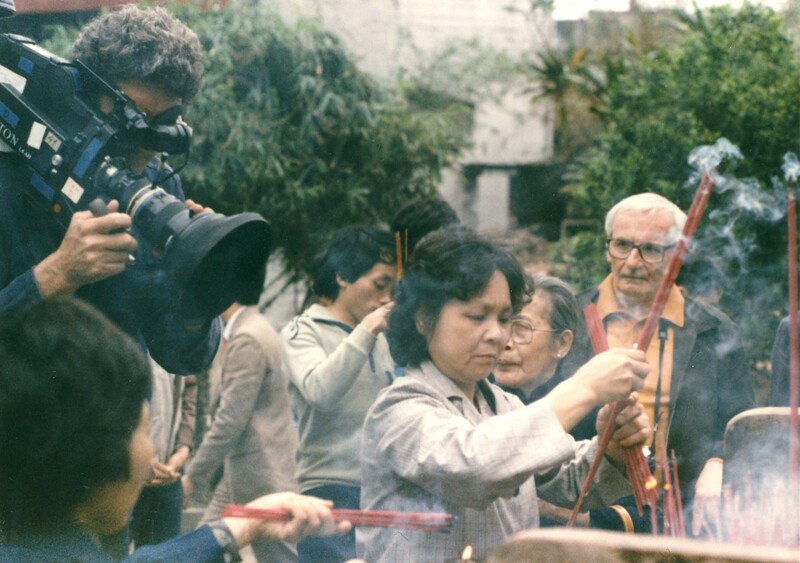 The summer and autumn of 1985 were spent editing the footage shot in China. In October 1985 Anderson screened his film for Wham! and their management. The film was far from being a straight pop promo as it looked away from the band and spent some time examining China and its people. It also stripped the glamour away from the event, showing the tedium of touring. A few days after the screening Anderson was informed that he was being removed from the project because his film was not what was expected or required. Before he left Anderson’s made a copy of his version of the film, which he called If You Were There and it is this tape which is part of the Anderson Archive. Lindsay Anderson on location in China. Following Anderson’s removal a new director was brought in and additional concert footage was shot in London at great expense. A new version of the film entitled Foreign Skies was screened at Wham!’s farewell concert at Wembley Stadium on 28 June 1986. This film was 20 minutes shorter than Anderson’s, added far more concert footage of Wham! and removed most of Anderson’s documentary footage of China. In If You Were There Anderson attempted to do far more than just produce a pop promo. The visit of Wham! to China came at a time of great change as consumerism, pop music and western tastes and fashions began to be absorbed by the old communist state. Anderson captured a society on the cusp of change. As with his award-winning documentary films of 1950s Anderson treated his subjects with warmth and compassion. The people the camera encounters are full of life, friendly and enthusiastic, and Anderson captures the vibrant atmosphere of street life in Beijing and Canton. He does not forget, however, that this is a film about Wham! and their historic visit to China, live performances of the band in Beijing and Canton forming the climax of the film. While George Michael and Andrew Ridgley sometimes seem bemused by the welcome extended by their Chinese hosts (there are only so many members of the Communist Party you can shake hands with) Anderson manages to catch some unguarded moments of fun and laughter where the excitement of being performers at the peak of their popularity shines through. Angered by the rejection of his film Anderson wrote an open letter to the crew who worked with him on the documentary in November 1985. In it he detailed the circumstances surrounding his removal from the project. He also summed up his frustration with the situation in characteristically bullish style (Ref. LA 1/10/3/7). Anderson never had an opportunity to release his version of the film. Such are the complexities of the rights relating to If You Were There that it has never been publicly screened. The story of this most unusual project can, however, be traced in Anderson’s personal and working papers.